Bring a sense of old-fashioned charm to your living space with this rustic wall sconce. From the Buford collection by Franklin Iron Works, this rustic wall sconce evokes a feeling of farmhouse nostalgia. It comes in a bronze finish steel frame, with a layer of wood covering the faceplate for a charming effect. The clear glass shade gives a full view of the bulb used inside, making decorative light bulbs a great choice for this fixture. Vertical installation only. 8" high x 5" wide. Extends 5 1/2" from the wall. Weighs 2.4 lbs. Backplate is 8" high x 5" wide x 3/4" deep. Distance from mounting point to top of the fixture is 4" high. Glass shade is 6" high x 3 3/4" wide. Takes one maximum 60 watt standard base bulb (not included). 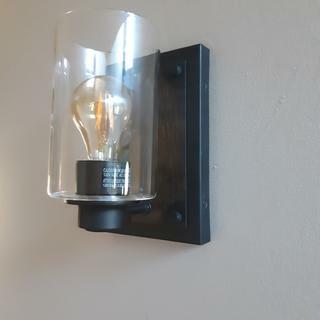 Rustic rustic farmhouse single-light wall sconce from the Buford collection by Franklin Iron Works™. Vertical installation only. Bronze finish over steel construction. Wooden faceplate covering. Clear glass cylinder shade. Plug in? Or hard wired? Not as rustic as I would have liked, the would almost matches the color of metal accent, hard to see the difference. Otherwise good quality and looks great. This contemporary wall sconce features a bronze finish rectangular framewhich houses the light source.